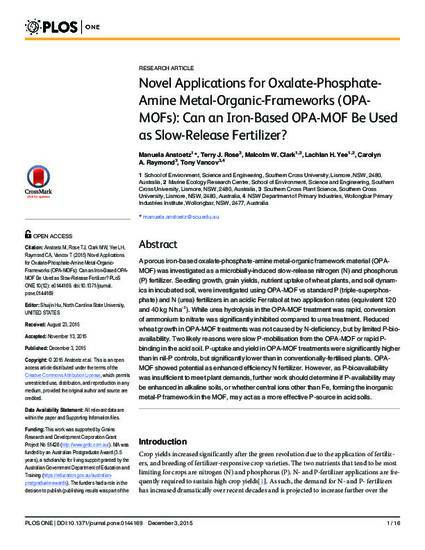 Novel applications for oxalate-phosphate-amine metal-organic-frameworks (OPA-MOFs): can an iron-based OPA-MOF be used as slow-release fertilizer? A porous iron-based oxalate-phosphate-amine metal-organic framework material (OPA-MOF) was investigated as a microbially-induced slow-release nitrogen (N) and phosphorus (P) fertilizer. Seedling growth, grain yields, nutrient uptake of wheat plants, and soil dynamics in incubated soil, were investigated using OPA-MOF vs standard P (triple-superphosphate) and N (urea) fertilizers in an acidic Ferralsol at two application rates (equivalent 120 and 40 kg N ha-1). While urea hydrolysis in the OPA-MOF treatment was rapid, conversion of ammonium to nitrate was significantly inhibited compared to urea treatment. Reduced wheat growth in OPA-MOF treatments was not caused by N-deficiency, but by limited P-bioavailability. Two likely reasons were slow P-mobilisation from the OPA-MOF or rapid P-binding in the acid soil. P-uptake and yield in OPA-MOF treatments were significantly higher than in nil-P controls, but significantly lower than in conventionally-fertilised plants. OPA-MOF showed potential as enhanced efficiency N fertilizer. However, as P-bioavailability was insufficient to meet plant demands, further work should determine if P-availability may be enhanced in alkaline soils, or whether central ions other than Fe, forming the inorganic metal-P framework in the MOF, may act as a more effective P-source in acid soils. Anstoetz, M, Rose, TJ, Clark, MW, Yee, LH, Raymond, CA & Vancov, T 2015, 'Novel applications for oxalate-phosphate-amine metal-organic-frameworks (OPA-MOFs): can an iron-based OPA-MOF be used as slow-release fertilizer? ', PLos One, vol. 10, no. 12.